Members of the Warren County Post were present to help start up the local Legion. 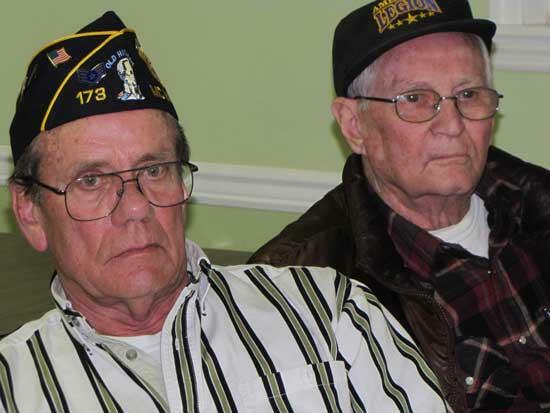 The newly formed Hilton Stone American Legion Post #279 met for the second time Thursday night at the Senior Citizens Center. This was an important meeting for the newly formed group. They nominated members to fill the positions needed to operate. There were members from other Posts who will be with the new Post and guide the members through the first part of the year. The knowledge of these members from the other Posts will help get the local Legion up and running in good time. Dan Bowling, who has done a tremendous job getting the club off the ground here in Cannon County, opened the meeting. The meeting began with the Pledge of Allegiance and then an opening prayer. Bowling then asked that if anyone was interested in a certain job; if so they could speak up and put themselves in a position to be nominated. Britt Knox was nominated to be the first Commander of this Post. The Vice-Commander went to Bob Eisenmann of the Hurricane Creek area of Cannon County. Retired Sgt. Penny Daniels was nominated to be the Post Adjutant; Daniels is the county’s Veterans Affairs Officer. The financial office for the Post will be Dan Bowling. Although at this time they are nominated, someone else could be nominated at next month’s meeting. If unopposed they will be sworn in as the Posts’ Officers. Charlie Harrell, Retired Colonel Jim Stone and Bob Stoetzel will serve as the executive committee; the Unit Commander will be involved with the Executive Group. The members of the other American Legions Post and the District Commander will be present next month for the swearing in ceremony. The American Legion has pet projects. They work closely with Boy Scout of America, Boys State and American Legion Baseball. Many of the professional ball players of today had their start in American Legion ball clubs. Not only do they sponsor clubs in the aforementioned organizations, but their duty is to the community and with the young. In today’s atmosphere of the War on Terror there are many of the nation’s soldiers who have fought continuously since the Gulf War. The men and women who are on duty now are in a time of war and are eligible for membership. We still have WWII veterans around although they are passing away at a rate of 800 a day in the US, there are still plenty of Korean War vets around and then the veterans of the Vietnam War (1961 through 1975) are also eligible. From 1982 through 1984, you have Lebanon and Grenada and Panama from 1989 to January 31 1990. In August 1990 we entered the Gulf War which has not ceased since that time to today, which was determined by the U.S. government. The Hilton Stone Post 279 will be getting together a color guard to stand guard over funerals of veterans when they pass away. “We will honor their memories and be at the service of their families during the funeral,” said Commander elect Knox. It is the desire that the newly formed Post will shine the light in the community to bring notice to the military veterans who have fought to keep America free. If you know a friend or relative who has been looking for something to get involved with, and is a veteran please tell them about the American Legion, they are invited to come to the meeting to see what we are about. If you are a Vietnam Veteran and find it hard to relate to anyone or just to be together with your own kind who has experienced what you have experienced, tell them about the American Legion. After next month’s election the chosen officers will post their phone numbers to allow you to get your questions answered about this service organization. The Legion also has auxiliaries (wives of service men) and the sons of the American Legion. More will be posted later or you can find the web site and learn more about your American Legion.